One of my favorite farmers, Annabelle of La Tercera Farm made her seasonal return to the Berkeley Farmers’ Market a couple of Saturdays ago. I’m always happy to see her because she grows really great shelling and dried beans, wonderful hard squash and exotic Italian heirloom greens. Plus I love chatting with her. Annabelle also keeps me from becoming jaded. Being in the food business and living in the East Bay within biking distance of nearly a market a day and many fine restaurants it would be easy to think that there’s nothing new under the sun. But that’s not true. Annabelle always has at least one item that is completely new to me. That week it was bunches of intensely fragrant herbs labeled Za’atar. This is the fresh green herb that the spice mix Za’atar is named for. It’s not something you see around here. 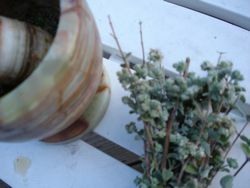 It looks and smells a little like a member of the thyme family but the leaves are dusky colored and velvety like sage. This bunch was flowering so it had a spicy floral aroma and a pungent, slightly mentholated flavor. The flowers are much stronger than the leaves. Let’s just say it’s not a timid herb. I asked Annabelle what to do with it and she said: “pound it with olive oil and make flatbread” Annabelle speaks with such authority you’ll likely find yourself following her directives without questioning. I’m embarrassed to say I’ve never made flatbread before. I make pizza all the time and both flour and corn tortillas—which of course are all types of flatbread, but I’ve never made anything I’d actually call flatbread. I started with a recipe for Tandoor-baked Bread in an old Indian cookbook I’ve never used and added baking soda and yogurt, omitted the egg that was called for and replaced some of the white flour with wheat flour. In a large bowl, mix together the flour, baking powder, baking soda, and salt. 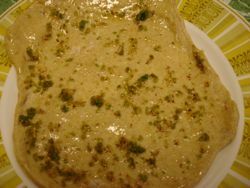 Add liquid ingredients and stir with a fork to form a soft dough. Knead in the bowl for 3 to 4 minutes. Let rest for 20 minutes, covered with a towel. Meanwhile heat a pizza stone in a 500 degree oven. 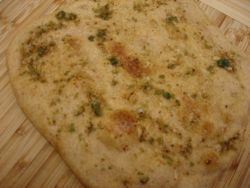 Divide the dough into 4 equal pieces and, working one at a time, roll out the each piece into a round about 1/4 inch thick, brush with the olive oil za’atar mixture, sprinkle with a little coarse salt, and place gently on the pizza stone. Bake until brown and bubbling, keeping the hot breads wrapped in a clean towel while you finish cooking the others. I can’t remember how long the baking time was, but it wasn’t long. The bread came out light, flaky, and crisp, like a delicate pita. We ate it with tomato-cucumber salad, lentils and Toulouse sausage from Fatted Calf. Nobody complained. This entry was posted in breads and pizzas, from the market. Bookmark the permalink. Post a comment or leave a trackback: Trackback URL.